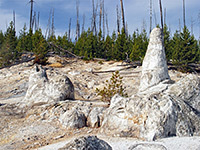 Most trails in the northwest, or west central region of Yellowstone National Park are located around Norris Geyser Basin; as well as thermal features, the area has several easily climbed summits and a number of woodland lakes. The backcountry is generally quite inaccessible, as for most of the way along the road north of Norris to Mammoth there is only one extended trail to the west (to Mount Holmes) and none to the east. Harlequin Lake 0.4 100 Harlequin is a minor, shallow lake at the foot of Purple Mountain, on the north side of the highway, 1.5 miles west of Madison Junction. The path leading to it passes through new growth pine woodland and ends next to the water, which is lined with reeds and pond lilies. Purple Mountain 2.5 1,560 The trailhead for the relatively short but steep trail to the top of 8,433 foot Purple Mountain begins along the main road a quarter mile east of the junction at Madison. The path crosses a meadow then climbs the south-facing slopes, which bear dense lodgepole pine woodland. At the summit is a lookout point and extensive views in some directions; the peak is the highest for some distance though the mountain is flat topped so the outlook to the north and west is rather restricted. Two Ribbons 1.5 (loop) level Running through a narrow strip of land between the highway and the Madison River, this boardwalk trail encounters pine and sagebrush forest recovering after the 1988 wildfires. The path begins 5 miles from the west park entrance and is not marked apart from several roadside exhibits about the effects of the fires. Artists Paintpots 0.6 80 Many people drive through Gibbon Geyser Basin without stopping, en route to Norris, but just half a mile from the road is an especially colorful and varied collection of hot pools, mudpots and small geysers, reached by an easy path. The starting point is 4.5 miles south of Norris and well signposted - the trail crosses a meadow and enters pine forest on the slopes of Paintpot Hill, ending with a small loop around the formations. 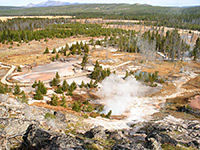 Gibbon Hill and Geyser Creek 3.6 (loop) 300 The Gibbon Hill and Geyser Creek groups are two active backcountry thermal areas containing several geysers, plus many pools, vents and mudpots, in wooded terrain west of Artists Paintpots. They may be reached by walking for a mile across sometimes boggy and or overgrown terrain, and explored by careful, off-trail hiking. Grizzly Lake 3 300 Small brook trout rather than grizzly bears are the main occupants of Grizzly Lake, reached by a relatively easy trail through open pine forest burnt in both 1976 and 1988. The unmarked trailhead is 6.5 miles north of Norris Junction - the path crosses Obsidian Creek, climbs up to a long, thin plateau then drops down into the valley of Straight Creek and to the north end of the lake. From this point, just under 2 miles from the start, the path crosses the creek and continues down the valley for another mile, to a junction with the Mount Holmes Trail. 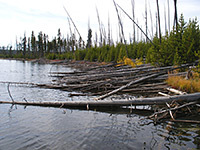 This last section is less used, frequented by mosquitoes and can be quite marshy. Ice Lake 0.3 30 This very short trail leads to a pretty, tree-lined lake in fairly level land beside the Gibbon River, covered by fir and pine trees partly burned in 1988. The trailhead is on the north side of the highway and 3.5 miles east of Norris; once at Ice Lake, the path continues 0.7 miles to a junction with a section of the Howard Eaton Trail. Left leads to Norris campground while right joins the Wolf Lake Trail after 1.5 miles. Geyser Basin 1 600 Monument is a largely extinct geyser basin on a hillside at the south edge of Gibbon Meadows, consisting of dormant white geyserite cones, a few of which occasionally emit puffs of steam. The trail begins half a mile south of the Artist Paintpots beside a road bridge over the Gibbon River; it follows the river northwards then bends back southwest, climbing steeply through new growth pine woods to the basin. Geyser Basin 2.25 (loops) 100 Two wide footpaths loop through the fascinating volatile landscapes at Norris Geyser Basin - a 3/4 mile boardwalk trail across the white expanse of Porcelain Basin and a 1.5 mile route through the more isolated geysers and springs of Back Basin. This is by far the most popular hike in the Norris region. Solfatara Creek 6.5 430 The longest and least-used trail in the Norris area is along Solfatara Creek, a tributary of the Gibbon River that crosses a hilly region containing a number of small hot springs and gas vents. The path starts and finishes beside the main road; the south end is at the Norris campground and the north trailhead is at the mouth of Lemonade Creek, 3/4 mile south of Beaver Lake picnic area. 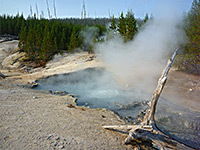 The southernmost 2/3 of the route is along the creek, while the northern third passes the largely dormant but sulphurous-smelling Whiterock Springs then climbs over a ridge, within sight of other springs and Lake of the Woods. The path is not regularly maintained and may be hard to follow, especially at the northern end. Sylvan Springs 2 170 On the west edge of both Gibbon Meadows and Gibbon Geyser Basin, Sylvan Springs are a group of hot pools, bubbling springs and sulphurous fumaroles. There is no path to this area but the springs can be explored by careful off-trail hiking; the approach is quite easy, across open grassland, though the ground becomes more uneven and overgrown around the thermal region. Wolf Lake 3.5 250 0.25 miles east of the Ice Lake trailhead is the unmarked start point for the hike to Wolf Lake, another tranquil pool tucked away in the forest around the far upper end of the Gibbon River. The route follows the north edge of the wooded Solfatara Plateau, crossing the river and smaller tributary streams various times, so is wet and muddy during early summer. After 1.5 miles it joins the Howard Eaton Trail from Norris and Ice Lake, while after Wolf Lake the route continues another mile to the larger Grebe Lake (see hikes in the east). Cougar Creek 15 1,400 The long route across Cougar Creek and much remote land to the north is one of Yellowstone's unmaintained trails, though ought still to be passable in summertime. It runs between the lower end of the Gneiss Creek Trail near the west entrance, and the path to Mount Holmes, mostly along the top of an lengthy, curved ridge between various river valleys on each side. Gneiss Creek 13 level A long hike through the almost completely flat grasslands of the Madison Valley, this trail crosses numerous streams including Gneiss Creek, as it follows the edge of the low hills that border the valley to the east. One trailhead is outside the park along US 191, a mile north of the US 287 junction, while the southern end of the path is 7 miles east of the West Yellowstone entrance station, just as the Madison River enters its canyon. Mount Holmes 10 3,000 At 10,336 feet, Mount Holmes is the highest summit in the west central section of Yellowstone, and serves as one of the park's three fire lookout points. The 20 mile round trip to the summit could be done as a long day trip though most people camp overnight. The route starts on the Norris-Mammoth road near Apollinaris Spring, just north of Obsidian Cliff; it heads north beside Obsidian Creek then turns west, along Winter Creek to a junction with the path down Straight Creek from Grizzly Lake. From here the gradient becomes steeper and the canyon narrows, opening out after a few more miles at a meadow next to Winter Creek Patrol Cabin, where the Trilobite Lake and Cougar Creek trails fork off, and which is the site of 2 primitive campsites. The final 4 miles of the route is steeper still, up the south face of Mount Holmes to its rocky summit above the treeline. Plateau 8 The Plateau Trail crosses Yellowstone's Central Plateau, through flat, wooded land holding many small lakes and marshy areas, though no major thermal features. The north end is along the Norris-Canyon road, 3 miles east of Virginia Meadows, from where the route climbs gently, curving around the upper end of Otter Creek and on to the Cygnet Lakes after 4 miles. These are shallow, boggy lakes surrounded by meadows, and mark the end of the maintained part of the path, though it can be followed further, staying nearly level until near the southern end where the land becomes more uneven, and the path joins the Mary Mountain Trail (see hikes in the southwest) at Mary Lake. Trilobite Lake 2 700 Enclosed on three sides by 10,000 foot mountains, and surrounded by dense pine forest, Trilobite Lake has a particularly impressive setting. The lake is reached by a spur trail off the path to Mount Holmes, and is 8 miles from the main road so reachable on a long day hike.